Romanian-born American writer, speaker, and teacher Elie Wiesel is a survivor of the Holocaust, the massive killing of Jews by the Nazis, Germany's radical army during World War II (1939–45; a war fought between the Axis powers: Italy, Germany, and Japan—and the Allies: England, France, the Soviet Union, and the United States). Wiesel is currently the chairman of the United States Holocaust Memorial Council. Elie Wiesel was born in Sighet, Romania, on September 30, 1928. He was the third of four children and the only son of Shlomo and Sarah Wiesel. Wiesel was encouraged by his father to learn modern Hebrew literature, and his mother encouraged him to study the sacred Jewish texts. His father instilled in him the ability to reason and from his mother, he learned faith. When he was fifteen, Wiesel and his family were taken to the concentration camps (harsh political prisons) at Birkenau and Auschwitz, Poland, where he remained until January 1945 when, along with thousands of other Jewish prisoners, he was moved to Buchenwald in a forced death march. Buchenwald was freed on April 11, 1945, by the U.S. Army, but neither Wiesel's parents nor his younger sister survived. His two remaining sisters survived, and they were reunited after the war ended in 1945. After the war Wiesel went to France where he completed secondary school, studied at the Sorbonne in Paris, France, and began working as a journalist for an Israeli newspaper. In 1956 he moved to New York City to cover the United Nations (UN; a multinational organization aimed at world peace) and became a U.S. citizen in 1963. He was the Andrew Mellon Professor of Humanities at Boston (Massachusetts) University in the mid-1980s. Wiesel's writings bear witness to his year-long ordeal and to the Jewish tragedy. In 1956 Wiesel's first book, a Yiddish memoir entitled And the World Was Silent, was published in Argentina. Two years later a much smaller version of the work was published in France as La Nuit. After the 1960 English language publication of Night, Wiesel wrote more than thirty-five books: novels, collections of short stories and essays, and plays. His works established him as the most widely known and admired Holocaust writer. Only in Night does Wiesel speak about the Holocaust directly. Throughout his other works, the Holocaust looms as the shadow, the central but unspoken mystery in the life of his protagonists, or main characters. Even pre-Holocaust events are seen as warnings of impending doom. In Night he narrates his own experience as a young boy transported to Auschwitz where suffering and death shattered his faith in both God and humanity. Night is widely considered a classic of Holocaust literature. Night was followed in 1961 by Dawn, the story of a young Holocaust survivor brought to work for the underground in preindependence Israel. Young Elisha is ordered to execute a British army officer in retaliation for the hanging of a young Jewish fighter. Through Elisha's ordeal, Wiesel describes the transformation of the Jewish people from defenseless victims into potential victimizers. The execution occurs at dawn, but the killing is an act of self-destruction with Elisha its ultimate victim. The struggle between life and death continues to dominate Wiesel's third work of the trilogy (a set of three), but in The Accident ( Le Jour in French), published in 1962, God is not involved in either life or death. The battle is waged within the protagonist, now a newspaper correspondent covering the United Nations, who is fighting for life after an accident. In these three early works Wiesel moved from a universe greatly influenced by God to a godless one. The titles of his books grow brighter as the presence of God becomes dimmer, yet the transition is never easy. such works as Legends of Our Time (1968), One Generation After (1970), and A Jew Today (1978). The themes of these stories remained tragedy and joy, madness and hope, the fragility of meaning, and the quest for faith. As a social activist, Wiesel used his writing to plead for Jews in danger and on behalf of all humanity. From his trips to Russia in 1965 and 1966, he produced The Jews of Silence (1966) which describes Wiesel's visits with Soviet Jews, or Jewish people living in the Soviet Union (the former country made up of Russia and several smaller states and run by communism, a political system where goods and services are owned and distributed by a strong central government). Wiesel captured the spiritual reawakening that was to mark the struggle of Soviet Jewry during the 1970s and 1980s. Soviet Jews were not Wiesel's Jews of silence. Western Jews, who dared not speak out on their brothers' behalf, were the silent ones. Wiesel was the recipient of numerous awards throughout his career, including the Nobel Peace Prize in 1986. His humanitarian activities were also rewarded with many honors, such as Eleanor Roosevelt Memorial Award (1972) and the International League for Human Rights humanitarian award (1985). Numerous honors have been established in his name, including the Elie Wiesel Chair in Holocaust Studies at Bar-Ilan University and the Elie Wiesel Chair in Judaic Studies at Connecticut College. In 1979 President Jimmy Carter (1924–) named Wiesel chair of the President's Commission on the Holocaust, which recommended creation of a memorial museum and educational center in Washington, D.C. 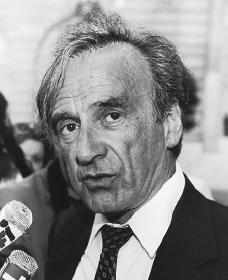 In 1980 Wiesel was appointed chairman to the U.S. Holocaust Memorial Council. In 1985 Wiesel led the opposition to President Ronald Reagan's (1911–) trip to a German military cemetery which contained the graves of Adolf Hitler's (1889–1945) elite S.S. Waffen soldiers. Speaking in 1984 at the White House, where President Reagan presented him with the Congressional Gold Medal, Wiesel summarized his career, "I have learned that suffering confers no privileges: it depends on what one does with it. This is why survivors have tried to teach their contemporaries how to build on ruins; how to invent hope in a world that offers none; how to proclaim faith to a generation that has seen it shamed and mutilated." Brown, Robert McAfee. Elie Wiesel: Messenger to All Humanity. South Bend, IN: Notre Dame University Press, 1989. Cargas, Harry J. Conversations with Elie Wiesel. South Bend, IN: Justice Books, 1992. Greene, Carole. Elie Wiesel: Messenger from the Holocaust. Chicago: Children's Press, 1987. Wiesel, Elie. All Rivers Run to the Sea: Memoirs. New York: Knopf, 1995. Wiesel, Elie. Night. New York: Hill and Wang, 1960. This article was very good. It would be hard to tell everyone about my life if it was like that it shows that you really want people to understand what cruel things you had to experience when you were young. i wish it would have never happened, but it did so that is why i think Wiesel is tryig to tell about his life in the holocaust. we need to be educcated on what happened so we wont repeat history. I am currently learning about the Holocaust in school right now and our first project was to research the author of Night because we would be reading. Even though what Sarah said is true, we have already repeated history, and all we can hope is that our current generation won't repeat it again. Many people wish it didn't happen, my family line is German, and my table partner is Jewish, it is very uncomfortable, and yes all Nazis were German, but not all Germans were Nazis. I am intrigued to read the book and I hope this website like most other websites I visit, I wish they would have citation information. Thank you Eliezer Wiesel, thank you very much for sharing your knowledge. I want to know who made this website. We are doing a Project in English class right now. The project is on the holocaust and we had to pick a topic our teacher gave us and I chose Elie Wiesel. This website was helpful, but we have to do it in MLA format and I'm only in 8th grade. This stuff is new to me and I don't understand it. hi i love this website. I dont know about anyone else but im gonna use this website for all of my projects.